Help your favorite golfer beat his personal best! Small enough to fit in a golf bag, yet big enough to clearly record and keep track of scores, this sophisticated gift is a must-have for golfers of all ages. One Top Grain Genuine Leather Golf Log. 48 Pages with Blank Logs for 48 Rounds of Golf. Gift arrives presentation-ready in signature gift box. A free card with your personal message is included with your gift. Free Embossing! One line with up to 15 characters. Enter information to be engraved using the personalization option during checkout. Personalized Leather Bound Golf Log is a hand delivered gift. These gifts are delivered by one of our local design centers located throughout the United States and Canada. Same day delivery is available for most gifts when ordered before the cutoff time. The cutoff time for Personalized Leather Bound Golf Log is 2 PM in the recipient's time zone. Top grain leather golf log, handmade in the USA. Gift arrives presentation-ready in signature gift box. ordered the personalized leather Golf log. It shipped super fast, I had it 2 days later. It is very nice, looks impressive. I will order from GiftTree for many years to come. My husband absolutely loved it! He thought it was extremely thoughtful and was super excited to use it. The quality is amazing! Great for a gift! Absolutely beautiful. Package arrived very quickly and was presented well, I had to decide if I wanted to wrap it or leave as is! Soft leather, beautiful paper. Loved and so did the receiver of this gift!! Great gift for my daughter who just started golfing. Very nice. Name on it looks nice. Came very quickly after order. The golf log was beautiful! The box and the wrapping that it came in was exquisite! I know my cousin will love his personalized gift! THANK YOU!!! This was a gift. Liked that it was leather, but a little difficult to put in a pocket. A small pencil would be nice to come & keep with it. This is the second one I have bought for the same uncle. I as going to but new pages but that's not possible due to the pages are sewn in. He says he loves the log and it's beautiful (has his name on the front). So I guess a golfer can just keep th full logs and start on a new one. This is a great gift for any golfer, male or female. Nicely crafted. Love the gift box and tag. Quick shipping. Thank you!! I wasn't expecting the quality of the leather and the number of pages in the log. The engraving was great and it will be something I will be using throughout my golfing career. Thanks again. Christmas present for my father who is an avid golfer and travels around to different courses. Not only is this handy for keeping track of his stats, but it is beautifully presented and is high quality. Really love the personalized touch. Had this sent as a birthday gift to my friend and he loves it. Its beautiful and detailed. Perfect gift for the avid golfer. Also was delivered much sooner than expected. Very pleased! Great Father's Day present. Really liked the nice box it arrived in. Perfect for gift giving. Very nice gift for my grandson. My Grandson plays golf for his high school and does very well. When we saw this in my son's magazine we thought it was the perfect gift. Was very pleased when we received it and the looks and feel of it. My Dad is going to love this. Such great quality for a great price. I was very impressed with how fast the delivery was. Looks just as it appears in the picture. Nice, soft leather. Came in a very nice box so there is no need to wrap it. Very pleased with this purchase and I can't wait to give it to my husband on our anniversary! 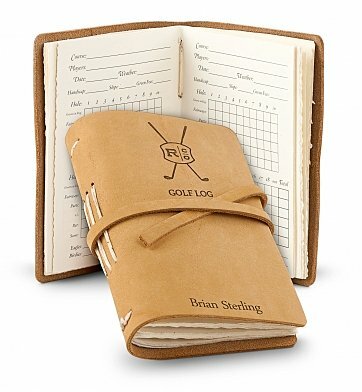 This golf log book is so unique! The presentation of the package was really great and the book came out exactly how the picture looks. The personalized message on the golf log came out exactly how I wanted it. The book was just a little smaller than I thought it was going to be. But everything else was great! This looks exactly as presented. I really like the aged look of the pages and the engraving is very nice. It was delivered very quickly and was in perfect condition in a beautiful presentation box. Fast Delivery and cool gift. I sent this to my boyfriend as an add-on Bday gift. He was working in another city and this gift was delivered to his hotel on time with no issues! I love ordering from Gift Tree and have never been disappointed. The only reason I'm not giving this 5 stars, Is because the engraving on log was different... It DID have my boyfriend's name on it, but did NOT have the cute golf logo on the center, which made it look a little plain. I will say that my BF loved it and it's presentation was great, otherwise! This gift went over big! Everyone at the party loved this golf log. I was surprised how nice it was presented. The box the bow the card. Great job. I will definitely be ordering from GiftTree again! The Golf Log is very well put together. The laser-engraving on the front turned out very nicely and adds a great touch. I ordered this for my dad for Father's Day, and it was very well received!! The whole package was put together beautifully- the book came in a beautiful box, tied with a bow. The gift message that accompanied it didn't look like a cheap addition- it was on a nice sturdy card. Overall, I was pleasantly surprised with the entire purchase! Received my "Golf Log" on the day it was promised. Very pleased with the quality of the product. It is for my son on his birthday. I know he will enjoy it. Will definitely shop through GiftTree in the future. Purchased this for my son in law and he absolutely loves it. Perfect size and having it personalized was a hit. He enjoys not only the leather cover, but most importantly the ability to track all his golf stats, including weather. He is very particular about his gifts and especially golf, he loved this log! I purchased this item as a gift for a client, love it! In my industry deals are made on the golf coarse, everyone is getting one! I gave this gift to my dad for his birthday. He loved the way it looked and it's size. The best part is that is name is on the cover! I purchased this as a Christmas gift for my boss and am very happy with the way that it turned out. I'm sure he will enjoy it. I purchased this Golf Log as a gift for my nephew. It came in a pretty box with a ribbon around it. It made a very nice presentation and the leather binding gave it a high end quality. This makes a very lovely gift and the personalization is an added plus. My husband loved the log. as an avid golfer he never kept a log with him, only electronically during tourneys. He was very happy and now takes it with him every time he golfs. Recommended for the the golfer who golfs regularly and likes to record thier performance. My golfer in my life loved it! He can't wait to show it off! I honestly know nothing about golf...only know he loves the game and plays alot. This was the perfect gift!